Himachal Pradesh Chief Minister Virbhadra Singh charged the NDA government with discriminating against the Congress-ruled states in the country. Addressing a press conference here today after his one-day sojourn in Nurpur Assembly constituency he underlined the need of a consistent criterion for granting economic aid to states. The Trust of Baba Balak Nath Temple at Deotsidh in Hamirpur district is contemplating many changes in its working with an eye to providing more facilities to pilgrims visiting the temple. Nearly 45-lakh devotees visit this shrine every year. SHIMLA: The Central Zoo Authority has sanctioned a Rs 4.93 crore project for “parent rearing” of highly endangered western tragopan at the Sarahan pheasantry. The entire population of the hill state has been brought under the public distribution system to ensure that the poor, particularly those living in the far-flung areas, get the essential commodities at reasonable rates. In all 12,50,833 families are being covered under the targeted public distribution programme. The Congress will focus on the panchayat functionaries to enlist the support of the rural masses during the ensuing Lok Sabha poll. The party high command has asked the state unit of the party to send detailed information about the panchayat pradhans, including their party affiliations and other facts. Himachal Pradesh Chief Minister Virbhadra Singh today assured a deputation of the HP Ex-Services League that its five-point memorandum would be considered and the issues relating to the Union Government will be referred to the latter. The Chief Minister, Mr Virbhadra Singh, has ordered a magisterial enquiry into the death of an infant at Dr R.P.G. Medical College Hospital here on Saturday. The infant, who was born at the hospital on Friday, developed some complications on Saturday evening and despite the fact that the hospital was functioning on that day no doctor was available to attend to him which led to his death. The Deputy Commissioner has been given Rs 50,000 by Mr Anil Sharma, MP, from his discretionary fund for the construction of a bus stand. A decade ago Mr Sukh Ram, the then Union Minister, had laid the foundation of a bus stand under a self-financing project. Two rescued leopards died in the Gopalpura Zoo in this district yesterday and the third was fighting for life, wildlife sources said here today. Shanti Alya has set up a home for orphans at Rampuri Keonthal village near Jubbar Hatti airport, about 28 km from here. Himachal Pradesh Chief Minister Virbhadra Singh charged the NDA government with discriminating against the Congress-ruled states in the country. Addressing a press conference here today after his one-day sojourn in Nurpur Assembly constituency he underlined the need of a consistent criterion for granting economic aid to states. Lashing out at the BJP for opposing the state government for laying foundation stones and inaugurating development projects in the state, Mr Virbhadra Singh clarified that an elected government had the preprogative to do so. He made it clear that he had laid the foundation stones by earmarking budgetary provisions for them. He added that he had sanctioned development projects worth Rs 6 crore for the Nurpur Assembly constituency. Earlier, the Chief Minister was accorded a warm reception by the local Municipal Council here last night. On the occasion he announced that Government Girls High School would be upgraded to senior secondary school from the next fiscal year and sanctioned sewerage schemes for Nurpur, Dalhousie and Chintpurni. He also announced a special economic package for the revival of the traditional cottage industry. This ancient temple is controlled by a government-owned trust and its income has risen from Rs 36 lakh in 1987 to Rs 5.20 crore in 2003. Sources in the district administration told The Tribune that the temple Trust was thinking seriously of handing over two colleges, a model school and an ayurvedic hospital to the state government. Though devotees visit the temple throughout the year, the main rush is seen from March 13 to April 13, when the annual Chaitra melas are organised there every year. During this period, devotees from various parts of northern India and even from foreign countries visit the temple and pay their obeisance. Sources said those working within the Trust felt that it was becoming difficult to provide more facilities to the devotees visiting the shrine with nearly 300 employees and officers, who were drawing around Rs 2.50 crore per annum as salary and perks. During 2003, the annual expenses of the temple were to the tune of Rs 4.84 crore as against an annual income of Rs 5.23 crore. There are reports that the Trust has sent a proposal to the Deputy Commissioner of Hamirpur, who is also the Commissioner of the temple under the HP Religious Places Endowment Act, for approaching the state government to take over the possession of its two colleges, a model school and an ayurvedic hospital so that the money being incurred on running these could be utilised for providing more facilities to the pilgrims. Though there was no official comment from any quarter on this issue, yet insiders in the administration say that this issue will figure prominently during a tour of the Chief Minister, Mr Virbhadra Singh, to Hamirpur tomorrow. A western tragopan at Sarahan pheasantry. 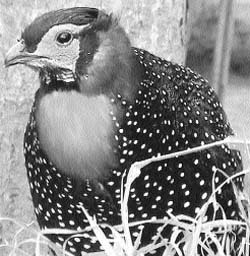 SHIMLA: The Central Zoo Authority (CZA) has sanctioned a Rs 4.93 crore project for “parent rearing” of highly endangered western tragopan at the Sarahan pheasantry. “Tragopa melanocephalus”, a rare pheasant is placed high on the Red Data Book of the International Union for Nature Conservation (IUCN) listing the highly endangered species. The Sarhan pheasantry has four such birds, three male and a female. The state Wildlife Department has been pursuing a breeding programme for the past about 15 years but without much success. There was an accidental breeding in 1993 but no further progress could be made because of lack of technical expertise and experience. A new hope was raised after the department engaged Mr John Corder, a conservation-breeding expert from the World Pheasants Association, as a consultant two years ago. He was impressed by the success of Dr Lalit Mohan, conservator of wild life, in achieving parent rearing of the endangered cheer pheasant and suggested that the technique should be used for breeding the western tragopan. A project was prepared under the guidance of Mr Corder and submitted to the CZA, which was approved during its recent meeting in New Delhi. The CZA will provide Rs 3.60 crore for the five-year project and the remaining Rs 1.33 crore will be made available by the department from the catchment area treatment plan funds. A sum of Rs 17 lakh will be released during the current year itself. Various required facilities will be created over an area of nine hectares in the pheasantry under the project. Besides seven breeding pans, veterinary hospital, quarantine room and incubators, big enclosures for training of the chicks under parents before their release in the wild will be built. To keep the predators at bay, an electronic security system will be put in place. It will have sensors to detect movements even during the night and in case an animal ventures close to the fencing the floodlights will be switched on automatically. Natural feed like barley and spinach on which the bird survives in the wild will be grown in the pheasantry. The chicks will be parent-reared for about six months before being released in the wild. The department will keep track of them after their re-introduction to study their habits and migration pattern. Mr Corder, who visited the pheasantry last month, suggested a number of measures to provide stress-free environment and changes in diet for successful breeding. The entire population of the hill state has been brought under the public distribution system to ensure that the poor, particularly those living in the far-flung areas, get the essential commodities at reasonable rates. In all 12,50,833 families are being covered under the targeted public distribution programme. Out of these 2,98,181 fell under the below poverty line (BPL) category and 78,700 have been identified as the poorest of the poor to be covered under the Antyodaya Anna Yojna. As many as 57,900 tonnes of wheat and 57,500 tonne of rice had been distributed to these families. Besides, 16,926 tonnes of wheat and 49,561 tonnes of rice had been distributed under the drought relief programme. Food security is being provided under the Annapurna scheme to the old, the destitute and the indigent citizens above 65 years of age. In all, 6,373 persons have been covered under the scheme and foodgrains are being provided to them free of cost. The state civil supplies corporation achieved a sales turnover of Rs 245 crore in 2003 registering an increase of Rs 43.5 crore over the previous year. The Government of India has sanctioned 11 notional principal distribution centres for Janjehli, Banjar, Udaipur, Dodra-Kawar, Chopal, Shillai, Narkanda, Anni, Pooh, Arki and Bara-Bangal in the state. After the opening of these centres, the transportation expenses up to these centres will be reimbursed by the Food Corporation of India. The corporation was also supplying cooking gas in the interior areas and it had opened 15 new agencies at Kumarsain, Nankhari, Junga, Shoghi, Chirgaon, Salooni, Tissa, Killar, Nahan, Haripurdhar, Kunihar, Darlaghat, Jhandutta, Sangla and Baldwara. It also plans to open more medicine shops at the subdivision-level hospitals and two such shops will be made operational at Chamba and Sundernagar shortly. The corporation supplies 4,500 tonnes of steam coal at cheaper rates to the government offices situated in the tribal belt of the state saving Rs 50 lakh to the state exchequer. The Congress will focus on the panchayat functionaries to enlist the support of the rural masses during the ensuing Lok Sabha poll. The party high command has asked the state unit of the party to send detailed information about the panchayat pradhans, including their party affiliations and other facts. The party has convened a meeting of the Himachal Pradesh Congress Committee for the purpose which will be attended by district presidents, block presidents and heads of frontal organisations on January 19. These party functionaries have been asked to furnish all the information so that it will be sent to the party high command. According to party sources, the party high command will prepare the poll strategy based on the panchayat data. The executive committee of the HP Ex-Services League, headed by its president and Tourism Minister, Major Vijay Singh Mankotia, met the Chief Minister late in the evening today at the Mini Secretariat and presented him a five-point demand charter. According to Major Mankotia, three major demands relate to the Union Government which, despite repeated assurances, had failed to implement them. He said the main demand was of one rank one pension which had been denied though the Chairman of the Parliamentary Committee on Defence, Mr M.L. Khurana, had announced during the Vidhan Sabha elections at Dharamsala that this demand would be met. He said the other two demands related to non -implementation of the recommendations of 5th Pay Commission in relation to ex-servicemen below the rank of Subedar . He said no Army man of lower rank served for 30 years and as such they could not be equated with civilian employees. The third demand was for enhancement of recruitment quota of the state which had been drastically slashed when the population was considered as the benchmark for recruitment. Major Mankotia said recruitment in the Army was a major source of employment for Himachalis and as such the old quota must be restored. He said the chief minister was requested to take up these issues with the Union Government . The league appealed to the Chief Minister to set up a monitoring committee so that the benefits granted to the ex-servicemen, war widows and the dependents of ex-servicemen were implemented fairly in the state. He reminded Mr Virbhadra Singh that such a committee had been set up by him earlier but was scrapped by the previous government. He also appealed to the Chief Minister to restore the grants-in-aid for the league which were discontinued by the previous Dhumal government. Major Mankotia claimed that the Chief Minister had assured them of all help in getting the problems of ex-servicemen solved. Earlier today, addressing a large public meeting at Jandaur in the Jaswan Vidhan Sabha constituency, Mr Virbhadra Singh said the industrial estate at Sansarpur would be developed to ensure that it emerged as a hub for industrialisation of Himachal Pradesh. He said the state government had already invested more than Rs 3,300 crore in the industrial estates and the investment would not be allowed to go waste. Earlier, the Chief Minister inaugurated a Rs 34 lakh Jandaur Lift Irrigation Scheme. Rural Development Minister Sat Mahajan, Transport Minister G.S. Bali, Chief Parliamentary Secretary Mukesh Agnihotri and Chairman of the Women’s Commission Viplove Thakur and other leaders accompanied the Chief Minister on the third day of his tour to Kangra. The Chief Minister, Mr Virbhadra Singh, has ordered a magisterial enquiry into the death of an infant at Dr R.P.G. Medical College Hospital here on Saturday. The infant, who was born at the hospital on Friday, developed some complications on Saturday evening and despite the fact that the hospital was functioning on that day no doctor was available to attend to him which led to his death. The family protested outside the hospital and later went to the office of the Chief Minister where the private secretary reported the matter to Chief Minister. Mr Virbhadra Singh, who was in Nurpur, has asked the Health Minister, Ms Chandresh Kumari, to visit the bereaved mother at the hospital and ascertain the facts. Kangra Additional District Magistrate visited the hospital today and recorded the statements. The Deputy Commissioner has been given Rs 50,000 by Mr Anil Sharma, MP, from his discretionary fund for the construction of a bus stand. A decade ago Mr Sukh Ram, the then Union Minister, had laid the foundation of a bus stand under a self-financing project. It had been envisaged to make the basement a sprawling commercial complex along the NH-21. The project fell for political rivalries and regional considerations. A workshop with rusting roofs had been converted into a bus stand decades ago when it was shifted to the Padal area. The bus stand has a bumpy platform, stinking lavatories, dirty waiting rooms, heaps of garbage, flies and mosquitoes buz all round. The benches are infested with bugs. Stray cattle roam as buses enter and leave the stand. The bus stand was meant for 100 buses but now 1800 buses pass through the stand. Conservator Forests R.C. Bergal said two leopards who were entrapped in Jalladhi area of Hamirpur district and from Droah in this district were rescued by forest authorities and shifted to Gopalpura Zoo but could not sustain the shock and died yesterday. Mr Bergyal said entrapped wild animals undergo a severe shock due to the inhuman action of trapping them which results in their death. He said cases by the wildlife authorities were registered with Hamirpur, Dhera and Palampur police under the Wildlife Act. Set up by Justice Kamlesh Sharma, a retired judge of the state High Court, the trust has constructed a five-storeyed building with a capacity to house at least 30 orphan and homeless children. At present 13 girls are being brought up at the home.